Tuesday, May 15, 2018, 12:30 – 1 p.m. 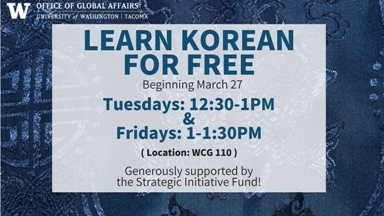 Learn Korean in an informal setting and for free with international student Jemin Kang. Lessons on Tuesday and Friday of each week will cover the same material. This program is generously supported by UW Tacoma's Strategic Initiative Fund.